4CYTE - A one of a kind Joint Support product for dogs that can put your dog on the path to a more active, happy life. How Is 4CYTE Canine Superior To Other "Joint Supplements" On The Market? Protects: Supports the natural mechanism to maintain healthy cartilage and joints. 4CYTE Canine is the only product available with the inclusion of ‘Epiitalis®’ – a patented plant extract that contains a range of free fatty acids which may be responsible for chondrocyte stability. Prevents: Assists to maintain normal joint function. The use of 4CYTE may reduce the enzymes that break down cartilage. Restores: Contains a range of compounds known to be necessary for promoting healthy joints. 4CYTE Canine provides a range of naturally occurring Omega-3 and 6 fatty acids and GAGs, essential for the production of cartilage. Relieves: Potential to assist with recovery times after excessive exercise and reduce the symptoms of resulting aches and pains. 4CYTE Canine may reduce the production of the enzymes that effect joint function. 4CYTE Canine is a revolutionary complete joint support supplement for dog owners targeting all key areas of joint function. 4CYTE is the first product proven to actively promote chondrocyte proliferation. 4CYTE’s extensive product specific research has been peer reviewed and published in leading international journals such as and including the AJVR and the EVJ. 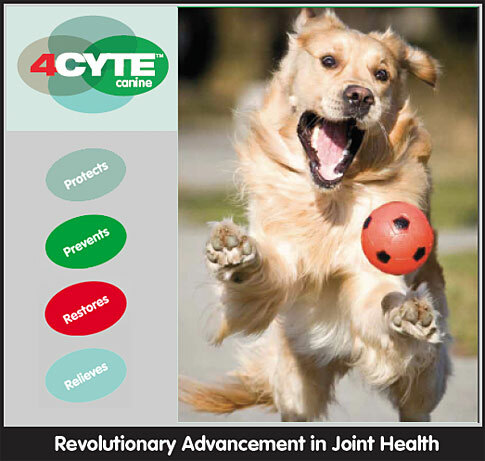 4CYTE has been scientifically developed for advanced joint support in dogs. A patent protected plant based oil, with proven chondrocyte proliferation and unique compounds targeting joints. Epiitalis® is a plant extract using a proprietary extraction method. What Does This Proprietary Extraction Method Do To The Epiitalis®? What Are The Ingredients Of 4CYTE Canine And What Do They Do? 4CYTE Canine is a unique blend of Epiitalis®, New Zealand Green Lipped Mussel (Perna canaliculas), Abalone (Haliotis iris) and Marine cartilage. The blend of key compounds obtains maximum effectiveness. In vitro studies show the combination is more potent than each ingredient on its own. These active ingredients are of a human grade, blended to a specific ratio and manufactured to meet a strict pharmaceutical standard. When can 4CYTE Canine Be Reccomended? Athletic and Performance horses at risk of developing reduced joint function. Does 4CYTE Conflict With Other Medicines? Is 4CYTE Canine Available Through A“VET ONLY”? It is recommended to get 4CYTE Canine through a veterinarian. We see it important that Veterinarians who understand your dog, its medical history and its symptoms make the correct diagnosis and treatment recommendation. How Much Glucosamine & Chondroitin Does 4CYTE Canine Contain? 4CYTE Canine contains the full complement of the naturally forming glycosaminoglycan’s and hyaluronic acid (including Glucosamine, Chondroitin, Keratin, Dermatan and Heparin sulphates), all necessary for the health of the synovial fluid and cartilage matrix. Our peer reviewed and published in-vivo and in-vitro research has demonstrated significant bioavailability and efficacy at the stimulation of GAG’s production, with GAG levels a key objective measure. Ask your Veterinarian for 4CYTE Canine Today For Your Dog! 4CYTE Dog is the best formula on the market today to help your your dog stay active and as pain free as possible. You'll love seeing your dog more active and happy- and so will your dog! Ask your Veterinarian for 4CYTE and get your dog on the path to better joint health for a long, active life-- naturally!